Its a no brainer this week. 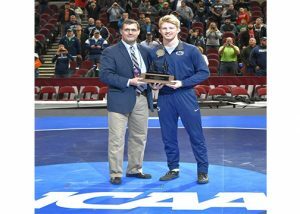 Bo Nickal of Penn State/Allen HS is Wrestlingtexas Wrestler of the Week coming off his electrifying finals performance at the NCAA-D1 Championships were he gets a finals revenge against Myles Martin of Ohio State who beat Nickal his freshman year in the finals. Nickal gets the fall in the 1st period not only giving him a 2nd NCAA Championship but securing the team title for Penn State. Nickal also wins the Most Outstanding Wrestler of the Tournament.